It’s finally starting to calm down from our datacenter upgrade. 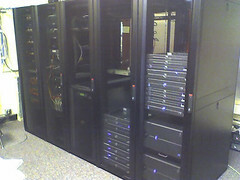 The new APC racks are in, the servers are all re-configured and installed in the racks. It’s been an incredible journey, and I for one am glad it’s nearly over. 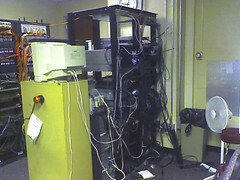 We ran into just about every problem we could – fiber was broken (over 16 strands), cables were too short, the temporary switch running our servers died in the first hour, but somehow everything worked in the end. This entry was written by T.J., posted on September 13, 2006 at 11:59 pm, filed under interesting. Bookmark the permalink. Follow any comments here with the RSS feed for this post. Post a comment or leave a trackback: Trackback URL.